Preparations are underway for the upcoming show season that starts with the Highland Cattle show at the Boulder County Fair at the fairgrounds in Longmont celebrating its 150th anniversary this year.
" The Boulder County Fair is the oldest fair in Colorado celebrating its 150th year. The Fair is a non-profit that rents the grounds and facilities from Boulder County who in turn is our main sponsor supporting the 4-H and open events during Fair. The Fair is a "Free" fair meaning no charge for parking or gate admission so please come as often as you would like. We want you to enjoy the "free" musical entertainment and many of the other activities on the grounds. Don't forget to purchase a ticket to any one of our motorized sports, rodeos or special events because that is one of the ways we can continue each year. We hope you also support our on-site vendors or the many sponsors who help to keep the Fair.."
The fairgrounds provide a comfortable family setting for a county fair at the foot of the Rockies. All kinds of interesting events are scheduled this year including a demolition derby, jousting knights and a tractor pull. The Highland show is scheduled for Friday, August 9th at 2 P.M.
Over the last few years the Boulder County Highland Cattle show has exploded in exhibitors and entries. While competitive, this show offers the opportunity to participate in a low threat, friendly and family environment where camaraderie and friendships are more important than ribbons. If you have any interest in showing, learning to show your cattle or just 'hanging out' with fellow Highland breeders consider putting the 2018 Boulder County Fair on your schedule. Over the last few years, the MSCHA board made improving the Boulder County Fair show and the MSHCA juniors program a priority. 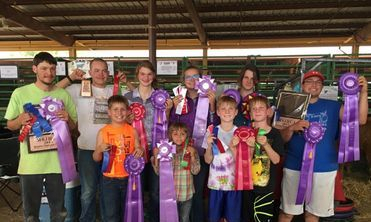 The MSHCA Incentive Fund Jackpot Bonus is an incentive program that rewards junior participants who compete in the Boulder County Fair and the National Western Stock Show. Stay tuned for details on this year's incentive program. Due to the increase in participation MSHCA and BCF are asking that exhibitors get their entries in as soon as possible to enable stalling for everyone.